I switched to a dark theme (Dolorean Dark). I like it and I think--it is better for eyes. However I have problems in some web pages. Most pages are intended to be shown on white background. On dark theme form controls have black background and mostly the font is also black, so the content of forms are invisible. I would like to use white theme on web pages in Firefox. 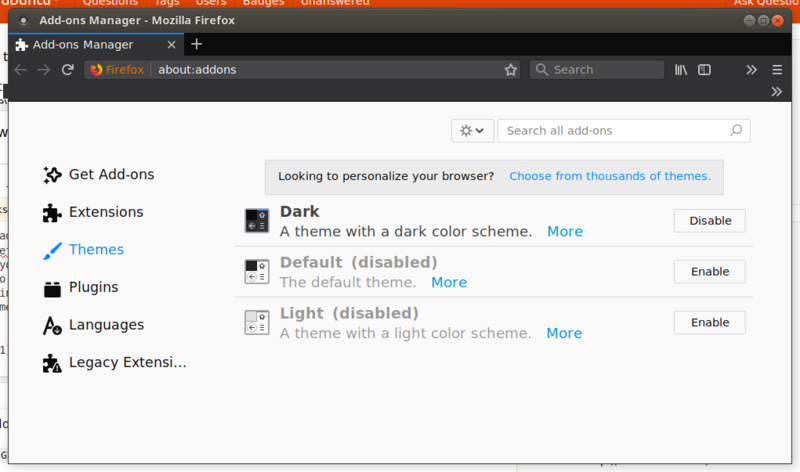 The best solution to tell Firefox that it should use the light theme instead of the dark is by specifying the GTK_THEME variable prior to launching. So, 4 ways you get for doing this..
WON'T WORK FOR localhost SITES! so if you are a web developer/designer it won't work out that well for you. Please help me by voting this up. You cannot do anything with it, except changing to a white theme! if you want to launch via desktop/panel icon or keyboard shortcut. Alternatively, you can use this add-on (credit to koushik), or this add-on to apply the userContent.css (credit to bkilinc) in Firefox 57+. Not the answer you're looking for? Browse other questions tagged firefox themes or ask your own question. How can I change tomboy note's background colour?